The dramatic life story of Haviva Reick stimulates historical and artistic reflection. She was born in today’s Rožňava in the year 1914. She lived with her family in Radvaň, however she spent a lot of time in nearby Banská Bystrica. She was a member of the youth movement Hashomer Hatzair (“Jewish scout”). She left to Palestine at the turn of the years 1938 and 1939 to build a new state, today’s Israel. In the year 1944, when the Brits were looking for people who would be able to perform diverse activity behind enemy lines, they selected her. She received much of the same training as James Bond would have had. After the outbreak of the Slovak National Uprising, she forced herself into American aircraft to come help in Slovakia. After the repression of the Uprising, she was shot dead near an anti tank trench in Kremnička in the age of 30 years. Haviva was no martyr or masochist, but she was brave and selfless. People who knew her said that she was cheerful, she liked to laugh loudly, she liked to dance, and she attracted men and was attracted by them. She only lived to 30, but she still worked for others – for her poor family, for the Jewish movement Hashomer Hatzair, for the Bratislava Jewish community. After her arrival to Palestine (today Israel) she also worked for the Kibbutz, for the illegal military units Hagana and Palmach, When she returned back to Slovakia, she had a double mission: for the British intelligence and finally for the rest of Jewish community in Banská Bystrica. 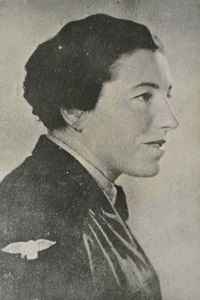 For the British Intelligence, she helped save the Allied pilots from the dangerous centre of the Slovak National Uprising and sent them back to the liberated territories. When the fascists invaded Banská Bystrica, she helped the rest of Jewish community, including old and weak people, to hide in the woods. They were probably betrayed and attacked by the fascists. She was captured, imprisoned, and killed on November 20th in Kremnička. She moaned in one of her letters from the training in Cairo: “I never had enough time for myself, but we are living in such times and we can not complain because of it.” Her feeling of responsibility for others was very strongly developed. She wanted to have family, children and a private life after the war. “When a person lives in a particular society, he must be active and responsible for it.” she wrote to her husband after her arrival to Palestine, when she was very disappointed from life in Kibbutz, because many of its members were not enthusiastic about the ideas of Zionism and socialism. Haviva Reick was a pawn in the big game of world wars and world powers; she had no chance to see the context in which she acted. When she prepared to go to Slovakia, she wrote in a letter to her friend Baruch Gross: “Yesterday big events happened, Paris was liberated, changes in Romania.” Peace seemed to be within reach. In spite of this, the Allies warned against premature enthusiasm in European countries. After the Allies landed in Normandy in the summer of 1944, the chain of the uprisings against fascism started. However the world powers divided up the territories which they liberated. The other world powers that had the other “agenda” could only watch helplessly and give only symbolical help. This was also the case of the Slovak National Uprising which waited for the Red Army. The situation was complicated and the German troops were excellently prepared, sometimes unfortunately also with the help of local informers. For these reasons we must respect all the more the heroism of insurgent soldiers, partisans and their foreign co-operators, of whom many died after the repression of the Uprising. The film was shown at the 7th Bet Debora Conference in April 2015. The project “Haviva- Return to European Remembrance” was funded with the support of the European Union under the Programme “Europe for Citizens”.